“Don’t get in the way of a man and his radishes,” Kevin Barry says firmly. The 1984 Olympic silver medallist is assessing a salad currently being prepared by his wife Tanya, the diminutive former gymnast. “There’s a serious radish shortage in Nevada. Haven’t you heard?” She replies. In an adjacent room, the man considered by the WBO as the heavyweight champion of the world sleeps, unaware of the skirmish in the kitchen. It’s just gone 9am in Henderson, the suburb of Las Vegas around 10 miles east of the strip. But this gated community is so quiet and peaceful it might as well be 1,000 miles away. It’s early morning but the day is already in full swing for Joseph Parker and his team. The undefeated 26-year-old has already been up once, eaten breakfast, completed one gruelling session and gone back to bed again. Word is that there are only 10 minutes left of his current nap. The day runs like clockwork in the house of Barry. The trainer and his family have called this large, detached property home for the last 14 years. Pictures of him, Tanya, his twin sons and eldest daughter hang around the place but the first thing you see on entrance through the front door is the burgundy-brown WBO belt, framed and impressive. 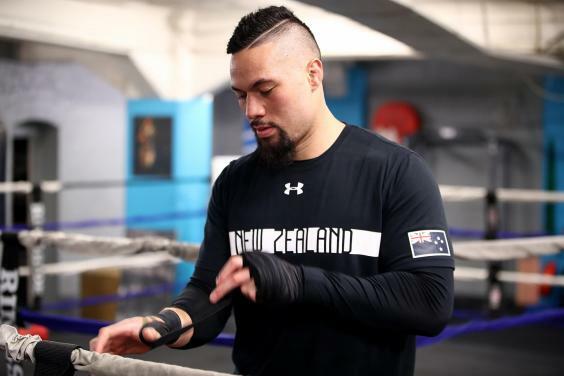 It is five years ago this month that Barry first met the young heavyweight from New Zealand with the fastest hands in the country. Parker has been living in the family home ever since. It is not long before the door to his bedroom swings open and the large, imposing figure of a smiling Parker shuffles into the kitchen in his flip flops. He takes one look at Tanya’s salad and says: “looks good”. “Not enough radishes if you ask me,” Barry counters. 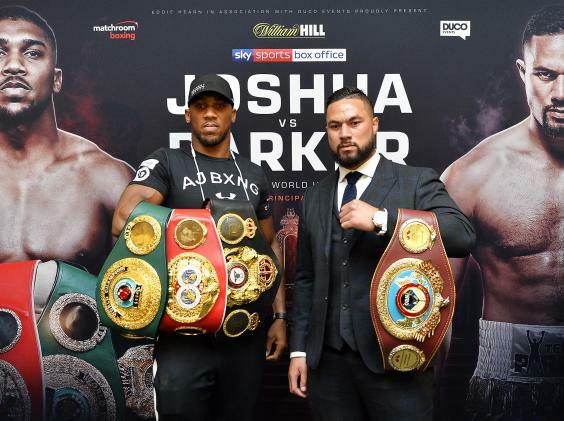 It is only weeks before the biggest fight of Parker’s life, when he challenges the sport’s latest superstar Anthony Joshua in a three-belt unification fight at a sold-out Principality Stadium in Cardiff. It will be the first time in history that two undefeated heavyweight champions have met on British soil. But, unlike other similar camps, there is no edge here. Everything is relaxed and jovial. The whole family, including their adopted son, are pulling happily in the same direction. Tanya runs the house and prepares the champion’s food. When it is put to Parker that it appears as though she is actually the one in charge, he flashes a smile. There is still another hard session in store before he gets to tuck in. 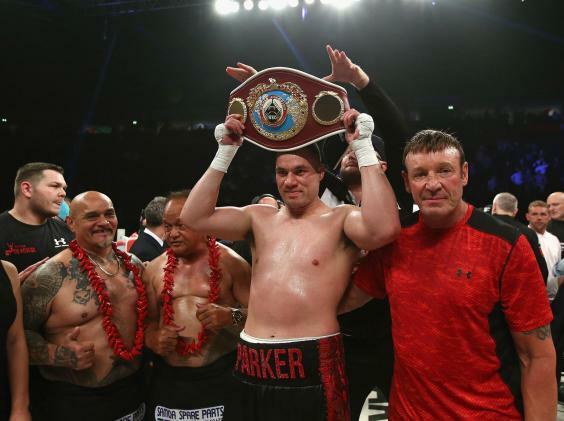 Parker, labelled the King of Pies by British TV host Graham Norton when he interviewed Joshua last month, has been steadily dropping weight in time for their showdown on Easter Saturday. He and Barry have agreed that being light and fleet-of-foot with a high punch output will be the key to victory in the Welsh capital. By now Barry has already left, bag over his shoulder and en route to the gym to prepare for the second session of the day. Parker follows in a Range Rover driven by Barry’s son and assistant Taylor, the youngster with an encyclopedic knowledge of the sport. Barry is ready and waiting in his brand-new facility. For previous camps, they had to drive for around three hours a day to get to and from the old gym in which they trained but they got their new home up and running in time for The Big One against Joshua. There is no classic gym stench, it smells more like a new car. Parker’s pregnant partner Laine and their 16-month old daughter, Elizabeth, remain in New Zealand. The fighter speaks to them every day via video call but concedes being so far away makes training camp especially testing. “You have to make sacrifices in order to look after your family sometimes,” he says. Barry and his son watch as Parker moves around the ring, shadow boxing like a man who weighs 60lbs lighter than his 17.5st body. Pictures of the team’s journey together hang in chronological order across the long back wall. The red, white and blue flag of Samoa, a nod to Parker’s heritage, is there too. Parker says. “It’s not like I sit and watch it but I catch little bits of it here and there. “He showed a lot of heart,” he says before spearing three more jabs into the air. 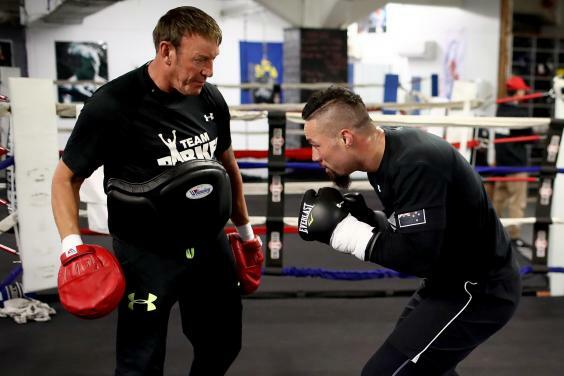 Once warm, Parker and Barry go through 12 three-minute rounds on the pads. It is calm and business-like. The trainer speaks quietly and clearly in between each combination. 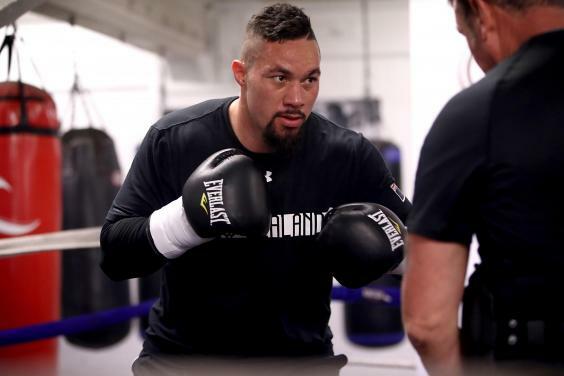 There is sparring arranged for the following day so the duo keep it light but there is no denying Parker’s blurring hand speed and the sort of power which has vanquished 18 opponents inside the distance. While Parker showers, Barry Senior opens up about his relationship with the polite, unassuming heavyweight champion who he calls ‘Chisel’. “Five years ago this month we met,” he says. “It has been quite a journey. When we first met I told him he would not recognise himself inside a year. Five years on he’s a totally different fighter. “For our first fight together, we worked on one combo: jab head, jab body, right hand over the top. It worked. He used it to stop Frans Botha in the second round. Before long it is back to the house and back to those radishes. Tanya has piled a generous portion of the pasta salad, full of prawns, egg and pasta, onto his plate. He tucks in. Later they will dine on steak. “We always have it the night before sparring,” Parker explains. There is still a cryotherapy session and a heavy weights circuit planned before bed too. There is also something of a ritual in the back garden on the agenda. On the far wall, across the large swimming pool, there is a large collection of model butterflies. “I’ve got about 65 butterflies in this house altogether,” Barry explains. There are two more being hung up today. The butterflies mean a lot to Barry. It is suggested that it might have something to do with the metaphor of beauty emerging through a process of hardship, much like his work alongside Parker.